What Smart Money Thinks of British American Tobacco PLC (ADR) (BTI)? Hedge fund managers like David Einhorn, Dan Loeb, or Carl Icahn became billionaires through reaping large profits for their investors, which is why piggybacking their stock picks may provide us with significant returns as well. Many hedge funds, like Paul Singer’s Elliott Management, are pretty secretive, but we can still get some insights by analyzing their quarterly 13F filings. One of the most fertile grounds for large abnormal returns is hedge funds’ most popular small-cap picks, which are not so widely followed and often trade at a discount to their intrinsic value. In this article we will check out hedge fund activity in another small-cap stock: British American Tobacco PLC (ADR) (NYSEMKT:BTI). British American Tobacco PLC (ADR) (NYSEMKT:BTI) has seen a slight increase in hedge fund sentiment in recent months. More specifically, during the third quarter, the number of funds bullish on the stock (among those tracked by Insider Monkey) inched up by one to 16. However, the level and the change in hedge fund popularity aren’t the only variables you need to analyze to decipher hedge funds’ perspectives. A stock may witness a boost in popularity but it may still be less popular than similarly priced stocks. That’s why at the end of this article we will examine companies such as Amgen, Inc. (NASDAQ:AMGN), TOTAL S.A. (ADR) (NYSE:TOT), and Gilead Sciences, Inc. (NASDAQ:GILD) to gather more data points. With all of this in mind, let’s take a glance at the latest action regarding British American Tobacco PLC (ADR) (NYSEMKT:BTI). How have hedgies been trading British American Tobacco PLC (ADR) (NYSEMKT:BTI)? 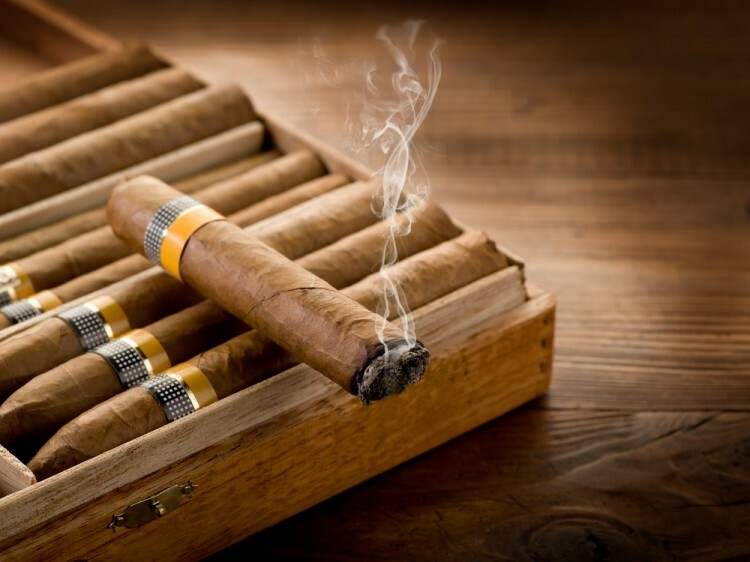 Heading into the fourth quarter of 2016, 16 of the hedge funds tracked by Insider Monkey were long British American Tobacco PLC (ADR) (NYSEMKT:BTI), which represents an increase of 7% from the previous quarter. 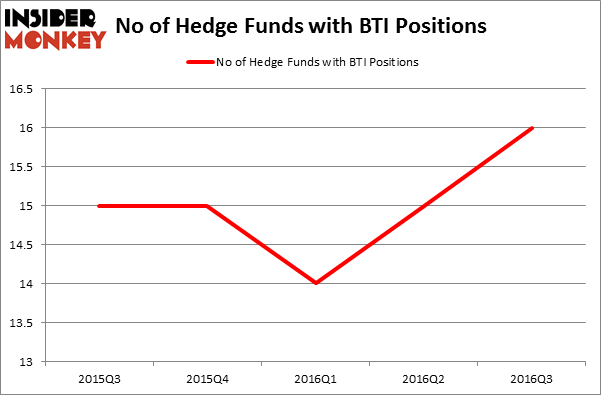 Below, you can check out the change in hedge fund sentiment towards BTI over the last five quarters. So, let’s find out which hedge funds were among the top holders of the stock and which hedge funds were making big moves. According to publicly available hedge fund and institutional investor holdings data compiled by Insider Monkey, Tom Russo’s Gardner Russo & Gardner has the most valuable position in British American Tobacco PLC (ADR) (NYSEMKT:BTI), worth close to $323.9 million, amounting to 2.7% of its total 13F portfolio. The second largest stake is held by Peter Rathjens, Bruce Clarke and John Campbell’s Arrowstreet Capital, which holds a $200.3 million position. Other hedge funds and institutional investors that are bullish comprise Jim Simons’ Renaissance Technologies, Richard Driehaus’ Driehaus Capital and John W. Rogers’ Ariel Investments. We should note that none of these hedge funds are among our list of the 100 best performing hedge funds which is based on the performance of their 13F long positions in non-microcap stocks. Is Tobira Therapeutics Inc (TBRA) A Good Stock To Buy? Hedge Funds Are Selling Concordia International Corp (CXRX) Is Cohu, Inc. (COHU) A Good Stock To Buy Right Now? Is Bottomline Technologies (EPAY) A Good Stock To Buy? Is Cryolife Inc (CRY) A Good Stock To Buy? Is 2U Inc (TWOU) A Good Stock To Buy?